To this day the weight of that knowledge firmly rests in the back of my mind, although my carefully chosen employers are not that fickle and I like that most of their staff are long-term permanent residents. Still, it’s one thing knowing you arrived with a couple of suitcases, it’s another to look around your apartment at the life you have made and home you’ve built, and try to determine how much you have and what you would take with you if you ever faced the situation. One day last year, as things settled down in my job after a harried first few months’ travelling constantly, and after some initial buys to make my flat more homely, I had this pressing feeling that I needed to put my mind at ease in the only way you can with such a weight: I made some preparation lists. It was these lists that really cemented my feeling that I was very much becoming attuned to the practices of being a minimalist. First list: What do I actually own here? My answer wasn’t so much itemised as it was a bunch of categories. From my categories I identified mostly clothes, toiletries, and electronics that are essential to my living anywhere. But I also had bought my first ever really nice, expensive bed linen complete with a throw rug and a couple of cushions to personalise the home amongst the bland IKEA furnishings. I had a few extra kitchen things beyond the basics supplied. Remember, my employers provide me with a furnished home. I’d also bought one or two gym things. Certainly I had refrained from buying anything but a few things that would bring convenience or comfort to my home. Second list: From these categories, what would I take home? Naturally, the said clothes, toiletries and electronics were the first things to go on the list. But in my mind and so on to the list, in the beginning I felt strongly that my new bed linen was coming as well because it was such a special first. Then I mentally packed my new digital bathroom scales (something I’ve never owned before) into the suitcase. I remember trying to decide how I would squeeze my extra large filtered water pitcher into the case, when I stopped and asked myself, “what are you thinking?” That’s when I put things back into perspective. What followed was more of a slow process than an instant decision. For example I decided initially I would leave my pitcher because it was large and I can buy another just about anywhere. Then later realised again that actually I drink tap water in almost all places around the world; I don’t need a filter pitcher anywhere but here. It was the same process for my linens. I decided my throw rug and cushions were too large to stow in a suitcase; that instead I could ditch the inner cushions and take with me just the covers themselves with the beautiful designs. Eventually I realised one day that beds are such a weird shape here – no standard single or double – that my linens were better to stay behind here and would lack the same meaning and importance elsewhere. When I leave, it’s far better to give them away to a favourite colleague or donate them to charity. They would have served the life of their purpose with me and would be best going on to someone else. Plus, I can buy what I need for my new home there, suited specifically to that time and place. Third list: What is not needed or used? This was a funny sort of list. Very short, I did manage to identify some clothing I wasn’t using and could take back to my storage in Australia. And my skis, finally retrieved from their former London home. Then I thought, “wait a minute!” Why am I sending stuff to storage when I am trying to clear storage right now? That’s when I made a dedicated charity box in my house and set about putting into there all the extra things I know I’m not needing or using. When I did take some things home to Australia, it was only useful favourites that I knew did not have a purpose here, eg. skis and winter clothes I had kept ready in case of snowy winter holidays. Far more ideal there than here, I also sold my skis over the Australian winter to ensure they didn’t go unused in my storage. And by the time I returned again last month for my grandmother’s funeral, I had heard plenty of whispers about an upcoming ski holiday and brought the winter ski clothes back as well. To this day, the charity box sits there growing, with things being added there on occasion, out of the way but allowing me the time to take something back if I change my mind. I think I’ll do another donation drop soon to clear it away once and for all. Fourth list. Not a list. More a recognition of what was left lying around. By the fourth list, I had clearly taken stock of everything I had in my Middle East home. 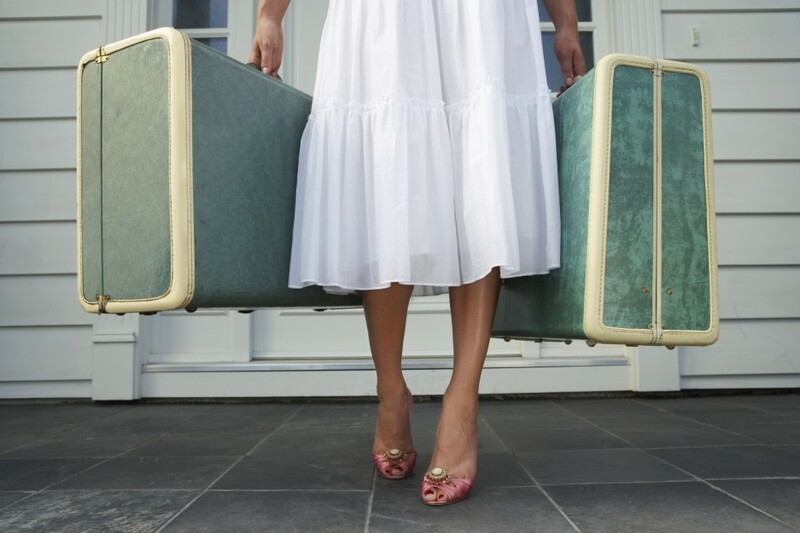 I knew exactly what I wanted to take with me on leaving – and it was nothing more than the clothes, toiletries and electronics that I had begun with. I determined everything else was replaceable if and when I decided I needed it again. I knew what was left and would remain here for the next user of my apartment. I felt richer and more free, to know I wouldn’t need to deal with excess luggage and the burden of lugging it from one place to another. Ridding myself of attachments to things here and seeing objects for what they are has uncomplicated my life and made things so much simpler. Over the past year, I have regularly contemplated what I have and adjusted my mind and my lists accordingly. Added to the charity box. Thrown things away or recycled them in a few drop zones I have found. As summer faded this year, I decided to purchase some extra things for my home to take it to a more functional level: a proper hamper, proper recycling bins. Then on a whim in the IKEA store, I opted for a few fake plants and vases to add more colour to my neutral-toned house. It’s amazing the difference these few things have made. I have no attachment to them and am happy for them to stay here forever. The colours around the house make me happy. The functionality makes my busy life feel more organised. And things feel more clear and uncluttered. At last I feel more settled, and prepared for any eventuality.